I dropped my reluctant (ahem, hungover) passenger at the dentist and then high-tailed it over to the high school to collect Mini from her last day of basketball camp. She and I got home and I told her that we needed to leave for our dentist appointments in an hour. Eddie was heading straight from basketball camp at the high school to the dentist with Reggie, a b-ball camp participant. Eddie was driving the teenage car. Ed's coaching abilities were limited by his broken wrist. He mostly escorted youngsters to the restroom and instructed them on where to to line up for the next drill. At least now that his full cast was replaced with a smaller cast, he could drive. The fact that he could finally drive Reggie to camp and back thrilled me. I wasn't home fifteen minutes before the dentist office called to say that the three kids were ready to be picked up. Damn. I forgot that minor detail. They didn't have a car there. I rushed Mini out of the shower and told her that we had to race back to the dentist earlier than I realized. Lad could drive them home in my car, and she and I could hitch a ride home in the kid car that Eddie was driving. So much thinking. My brain hurt. My children staggered out of the dentist office with looks of horror on their faces. This wasn't what you think. Their faces weren't all contorted due to a bad reaction to a fluoride treatment or even due to bad news about necessary fillings. They were appalled that they had been sitting there waiting for a ride home. I don't think anyone cared that Mini and I were now going to sit at the dentist office for 30 minutes prior to our appointment time. Were people that fuzzy on the concept of 'bring a book'? Until science uncovers some amazing discoveries and advances, there is only one of me. And this one of me had been to traffic court, missed a workout class, logged countless miles on the car in my adventures so far that day, and dealt with a hungover kid, who threw up on himself on the way to flipping traffic court. CAN SOMEONE PLEASE CUT ME A BREAK? AND until we win the lottery, we only own the three cars. Duh! Why is my life void of comments like, thanks for scheduling my teeth cleaning (OK, I doubt any kid is grateful for this, but it beats having a mother who allows rotten teeth), and I'm glad you reminded me to bring a book so that I wouldn't be bored to tears, and I now understand drinking in excess is stupid (so only one kid could potentially make this statement)? Now that our dentist appointments are complete, can someone please toss out an old toothbrush, or point out which one they legitimately use so I can toss out the old ones? Sigh. 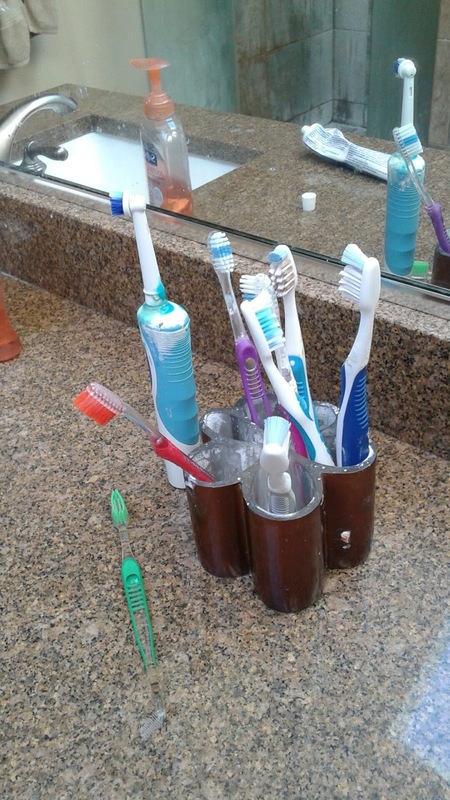 This picture includes 9 toothbrushes. This is in the kids' bathroom. There should be 6, but 3 of our kids are visiting our friends' lake house. They brought their toothbrushes with them. 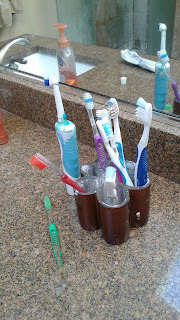 If my math is correct, then we are housing 12 toothbrushes when everyone is in town - FOR 6 PEOPLE!